Italy. The Greek colonies were spread along the coast as far as the heel of Italy, including Sicily. The first colony was established about 765 B.C. on the island of Ischia just off the coast of Naples. Campania was rich in Greek colonies (Cumae, Paestum, Ischia and Naples itself), and through this course participants will have the opportunity to investigate the successful expansion of Greek colonies and the profound impact they had on the further development of Italy. While Greeks were living on the coast, the inland areas of Campania were inhabited by the Italic populations, stationed on the mountain ranges of the Apennines: Oscan, Samnite and Lucani. Between the sixth and fourth century, these populations overtook the coastal areas, subduing the Greeks, and it is against them that the Romans will have to fight upon their arrival in Campania. Three different wars will be carried on (the so-called Samnite Wars), the third of which, in 290 BC, will mark the final victory of the Romans, and the beginning of the Roman hegemony in Campania. This training experience will introduce participants to the distinguishing features of the pre-Roman world, pointing out the cultural and social traditions we still share with them, transcending linguistic, ethnic and cultural boundaries Participants will take away all they have learned from this course, and find it relevant in many aspects of their lives outside of Italy. 4. to introduce the bay of Naples as a territory of further destination for art courses and travels. The methodology is based on both theory and practice. Rather, the theory will offer participants the tools they need to build a strong understanding of sites and their history once they are there. Campania with skilled guides and experts in the field, in addition to lectures and classroom sessions. Manuals with learning activities to complete will be provided. The lectures, lead by qualified archaeologists, will focus on significant and prominent aspects of Greek and pre-Roman cultures and civilizations. Participants will make themselves familiar with the ancient cultures and their history in a fun and enjoyable environment. By learning about this ancient society and by getting to know the aspects of its daily life, participants will become engaged and interested. This methodology allows for participants to connect their lives with the culture of ancient civilizations, and come away with a better understanding and appreciation for both the Greek and the Italic culture, history and society. 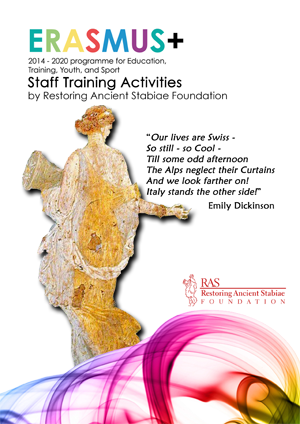 This will be a very-much outdoor based course as the participants will be visiting various sites. Highly qualified guides and trainers will ensure an easy approach to art, maintaining, at the same time, a high level of education. The course will be based on the balance between theory and shared experience, and on the participants ́ active contribution to the subjects and the themes discussed.